Macular degeneration, also known as AMD and ARMD (Age-related Macular Degeneration), is an eye disease that is one of the leading causes of visual loss in older adults. Macular degeneration is likely related to a variety of factors including genetic predisposition and inflammation, but the exact cause of this disease is unknown. AMD is the deterioration of the central retina, the macula. The macula is a small, specialized region of retina, and is responsible for central vision. Intact central vision is vital for reading, driving, and recognizing faces. Many older people develop mild forms of macular degeneration as part of the natural aging process. There are different kinds of macular problems, but macular degeneration is the most common macular disorder. Macular degeneration does not usually affect one’s peripheral vision like with glaucoma. For example, with advanced macular degeneration, people can generally see the outline of a television, yet may not be able to see the text of the TV screen. 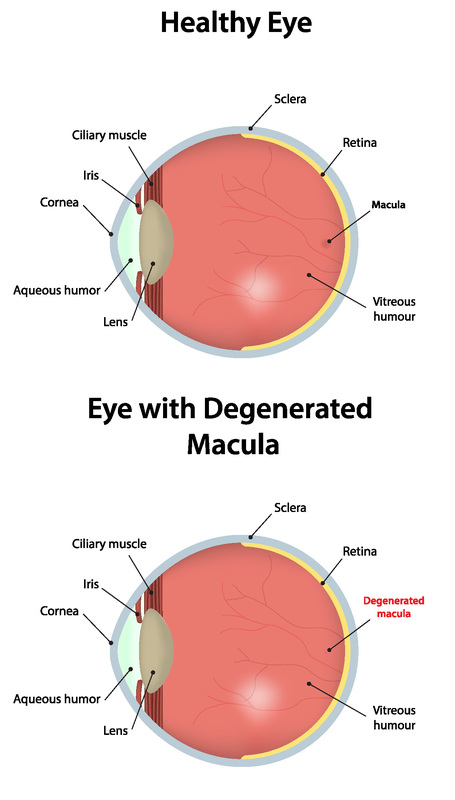 Macular degeneration is often grouped into two categories − “dry” and “wet” macular degeneration. The “dry” form is more common and can include loss of retinal pigment and deposit of material in the tissues underlying the macula. These changes can lead to distorted or decreased vision. As the disease progresses, changes in the blood vessels underlying the retina can cause bleeding or leaking, which is the “wet” component of wet macular degeneration. Wet macular degeneration is less common in patients, but can cause a more rapid deterioration of central vision. 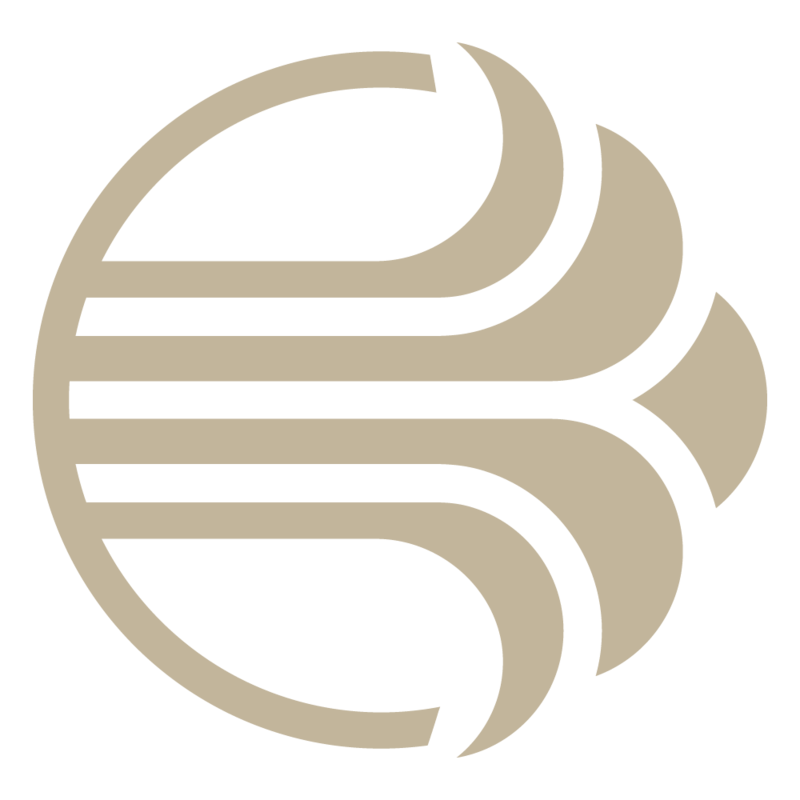 The wet form is treatable and should be addressed quickly. There is no known treatment for the “dry” form of AMD, although multivitamins and certain dietary elements (A.R.E.D.S. 1 and 2) can help slow progression of the condition. Low-vision tools such as magnifying lenses, specialized lights, telescopic glasses, and magnifying electronic devices may be helpful for patients with this form of macular degeneration. The wet type of AMD has enjoyed several treatment breakthroughs in the last few years. Anti-VEGF (vascular endothelial growth factor) compounds are used to stop the growth of abnormal blood vessels. These medicines (Eyelea, Lucentis, and Avastin) are administered on a regular basis and have provided great results for a previously hopeless disease. 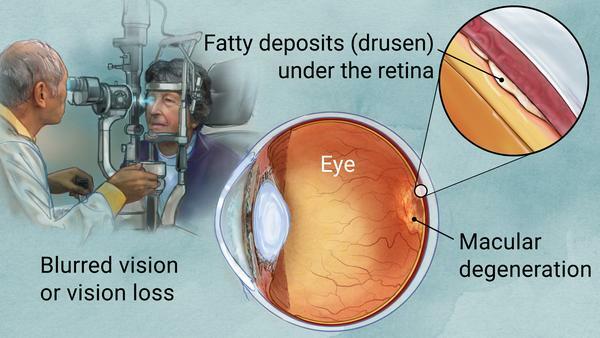 Once a patient has received treatment for AMD, they must continue to have regular examinations of the retina so that any additional growth of new vessels can be detected and treated. If the patient notices any new symptoms, they should be examined promptly. If you have a family history of macular degeneration or are a cigarette smoker, you can choose to make some lifestyle changes that could help lower your risk for macular degeneration. Maintain a healthy, well-balanced diet rich in fruits and vegetables, particularly greens and brightly colored vegetables. Obtain regular eye exams after the age of 60. Take a daily vitamin that follows AREDS 1 and 2 nutrition guidelines.